What did Denis Naughten do and what happened next? Confused by the controversy surrounding the Communications Minister? Catch up here. 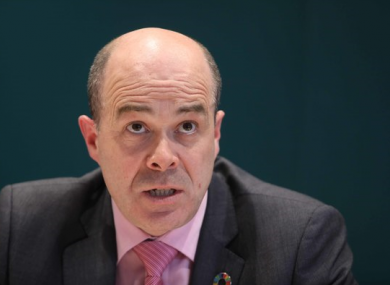 COMMUNICATIONS MINISTER DENIS Naughten has been embroiled in controversy this week over his contact with an Independent News and Media (INM) lobbyist about the proposed takeover of regional newspapers by the Denis O’Brien-controlled company. While the Roscommon TD looks to have weathered the storm for now, opposition parties say the debacle calls Taoiseach Leo Varadkar into question. In November 2016, Naughten had a conversation with Eoghan Ó Neachtain of Heneghan PR about INM’s attempted takeover of Celtic Media. The acquisition would have increased the number of INM-owned regional papers from 13 to 20. The minister told Ó Neachtain that he was going to refer the proposed takeover to the Broadcasting Authority of Ireland (BAI). The conversation took place two months before that decision was made public. It was discovered from documents filed by the Office of the Director of Corporate Enforcement (ODCE) and was reported in The Irish Times yesterday. Following the conversation, Ó Neachtain then allegedly told the managing director of Heneghan PR, Nigel Heneghan, who passed the information on to the then-chairman of INM, Leslie Buckley. INM pulled out of the proposed takeover last July. The Irish Times reported that information from the conversation between Ó Neachtain and Naughten was relayed by email to O’Brien, something which was outlined in the court documents. The merger was formally referred to the BAI in January 2017, the Irish Times says. Naughten defended his actions in a lengthy address to the Dáil yesterday. He said that there was “nothing wrong or inappropriate” in him telling Ó Neachtain that he would be taking advice on sending the proposed merger to the BAI. “This is not inside information but simply a reflection of the legislation itself,” he said. He said Ó Neachtain, who acted as press secretary to several governments, informed him that the Competition and Consumer Protection Commission was going to approve the merger. This was before the commission had told him of its decision. In response he said that he revealed that he would likely be referring the decision to the BAI but added that he would take the advice of his officials. Naughten said that while talking to Ó Neachtain he was expressing a personal opinion. Naughten told the Dáil yesterday that the decision for INM to purchase a further seven titles was always likely to go to Phase 2 process (which would refer the deal to the BAI). He added that he would have been criticised had he not referred it on to the BAI. The minister said it was public knowledge that this would most likely be the case, adding that he communicated his “personal view” that it was likely to go to phase 2 to Ó Neachtain. The minister stated that he made it “crystal clear” to Ó Neachtain that he would be following the advice of his officials, which he had not yet received. He insisted yesterday that he acted to the “letter of the law”, and invited any member of Dáil Éireann to view the entire file in his office. He said he did not have any “insider information” to give. Naughten also clarified there was no log of the phone call by his officials, no minutes or notes from the phone call, and that his officials were not told about the phone call. In hindsight, the minister said it would have been preferable had the phone call not taken place at all. When Naughten spoke to the Dáil about the proposed merger, on 6 December 2017, he did not tell them what he had told Ó Neachtain. What accusations are being levelled at Naughten? The revelation sparked a flood of reaction from opposition parties. Fianna Fáil’s deputy leader Dara Calleary said it “was not as simple as a phone call between two mates” and it smacked of “cronyism”. Solidarity TD Mick Barry said the minister was involved in a trade of information with “the big business lobbyist”, while Sinn Féin leader Mary Lou McDonald and Social Democrats TD Catherine Murphy accused him of deliberately misleading the Dáil. Murphy said Naughten misled the Dáil because he failed to inform it of his conversation with the lobbyist when he provided an update on the process less than a month after his conversation with Ó Neachtain. The controversy rumbled on today with the focus shifting to Taoiseach Leo Varadkar’s handling of the issue. None of the major opposition parties have yet said that they will be putting forward a motion of no confidence in the minister, however there have been calls for Varadkar to strip him of his ministry. The Taoiseach should ask him to stand aside, and then yes, if he is not willing to do that I believe he’ll have no option but to sack him. The Taoiseach needs to take questions and answer those questions around the complete lapse here. “And that’s what we want to hear from now, the Taoiseach cannot ignore his responsibilities on this issue to Dáil Éireann either,” he said on Today with Sean O’Rourke on RTÉ Radio 1. A spokesperson for the Taoiseach said he was satisfied with Naughten’s explanation in the Dáil. Cabinet colleagues including Minister for Housing Eoghan Murphy and Tánaiste Simon Coveney also backed the independent minister. Speaking in the Seanad today Naughten offered his sincere regrets but added that he was not responsible for how Ó Neachtain interpreted the comments. I sincerely regret expressing my view on this at that time. Anyone who knows me knows I am an accessible minister. “But I am absolutely clear that I said I would abide by the recommendations of my officials and the files show that is exactly what I did,” he concluded. Email “What did Denis Naughten do and what happened next?”. Feedback on “What did Denis Naughten do and what happened next?”.